Good morning! I've been up with the lark this morning and why? Yes, it's because I am well and truly addicted to the Less is More challenge that comes out on Saturday mornings! Crafters are challenged to make clean and simple cards according to a different theme each week and it's so much fun - do come and join in! 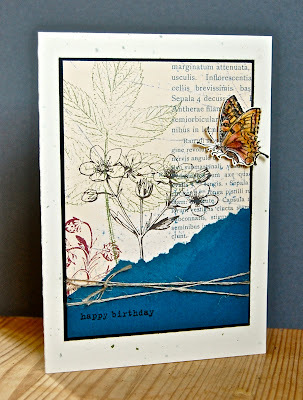 This week's challenge is to make a card using a butterfly motif. All last night I'd been thinking about a card after seeing the FTL 141 sketch on another favourite challenge site, Clean and Simple Stamping, and then today, it all suddenly became clear! I loved making this card - and it took very little time to make! It might look as if I've spent hours stamping those plants onto a carefully distressed old book page but it's actually part of one of the beautiful Botanical Gazette papers. I bought them to use for scrapbooking, as lots of my photos are taken in the countryside, but I've completely fallen in love with them and can see they'll be featuring on many of my cards too! I layered some torn Not Quite Navy card stock over the paper and knotted linen thread around it - I don't think I could live without this stuff! The sentiment is from Plane and Simple and has definitely become my most used 'happy birthday' sentiment! Here's my butterfly! It's yet another gorgeous image from my favourite set in the mini catalogue - Nature Walk (big fanfare here!) It's hovering here ready to get some nectar from that primula, but it's probably slightly confused about the black and white nature of the plant! Take an A5 piece of Confetti Cream card stock. Score and fold it in half to make a card base. Choose a part of the Botanical Gazette designer paper with some type and some plant images. Cut a piece about 12cm x 8.5cm. Cut a piece of Not Quite Navy card stock and tear it on the diagonal. Layer this over the paper. 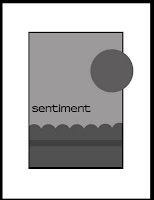 Stamp a sentiment in Basic Black ink using a stamp-a-majig to make sure it's straight. Place a length of linen thread above the sentiment and wrap around the card several times, finishing with a simple knot. Mount the panel onto a 12.75cm x 8.75cm piece of Basic Black card stock and attach to the card front. Stamp the butterfly from Nature Walk in Basic Black ink on a scrap of Confetti Cream card stock. Let it dry (blast with a heat gun if you're in a hurry - which I always am!) before colouring it with a blender pen and Rich Razzleberry and More Mustard inks. Cut the butterfly out with sharp paper snips and fix to the card front with a dimensional or two. Yesterday my oldest son went for a trial at a local cricket club. The club he belonged to last year isn't running a team in his age group this year but he's keen to carry on with the sport. At the end of the session, I met up with the coach to hear the verdict and, let me tell you, Simon Cowell couldn't have strung me along better! " I'm really sorry..." he began and I immediately had a vision of myself trying to comfort a brave but distraught son. "I don't think..." he continued (as I kept my eyes fastened painfully onto his face) "...we can offer your son..." (he is going to be so disappointed, I'm thinking) "... many games this season, but we'll do our best and he's very welcome to join us for coaching every week!" I'd nearly collapsed with the tension by the this point and had to have a stiff glass of wine to revive! Needless to say, my son had simply assumed he'd get in and took the whole thing in his stride! Thank you so much to everyone that left comments for me last week - I am bowled over by them and always return your visit if you have a contactable blog or email address. We can forgive the non white space, as its most certainly clean and simple. Although you do make everything look so simple anyway!! This is lovely Vicky, it has a real vintage feel to it. Beautiful. I love the splash of colour from the butterfly and the blue below, the gorgeous paper is the perfect backdrop - I love love love it! Beautiful card Vicky! Love the botanical papers you've used! Stunning card Vicki. That butterfly is gorgeous. Beautiful = love the patterned paper! Fantastic card as always Vicky. Stunning and I agree it does have a vintage feel to it. I love the vintage style this DSP brings to the card and I'm loving linen thread at the mo too, fab card! WOW - this is great Vicky. Hugs, Sandra My card is HERE! Beautiful card. Love how you tore the paper for the bottom border instead of punching with something. What a lovely colourful butterfly! Great bg - pretty bfly! Very pretty...the butterfly looks real!! Vicky, your cards are always fabulous...and this one is no exception!! Love how rich the colors are...and that paper is fabulous! Gorgeous card, Vicky. I love your very artsy creations! I love how you created the scene with your elements and the yellows and oranges on the butterfly really pop against the background. What a tease that man is but your Son is in and a happy chappy. Great card, lovely use of patterned paper - perfect! Love your beautifully coloured butterfly too! Very CAS and a gorgeous layout. A fab card Vicky. Yes, it does look as though it took ages to make. This is awesome my friend! I love how you placed the DSP with the torn blue layers and your butterfly is painted so prettily! Another inspiration for me. How very pretty!! Love how you used the sketch...very creative and lovely:)!! Vicky, this is beautiful. I love the papers you've used, and your butterfly looks wonderful. Beautiful work Vicky always a pleasure to view your gorgeous pieces of art. Oh, Vicky. I read this post and then took a break to empty my dishwasher (must get something done today! ), but I'm still smiling about your description of the conversation with your son's cricket coach. I'm sure he'll have a great experience... and will improve his game by leaps and bounds. But the way you told your thoughts as the coach is talking to you... haha... so mom-like. Loved it! And love your interpretation of the Clean and Simple Stamping sketch, too. Really a great card!